Give your hero +4 Attack this turn. 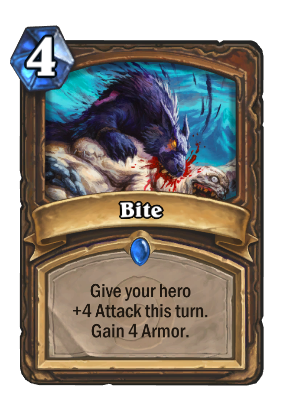 Gain 4 Armor. OMG OMG OMG! CHANGE THIS GAME TO MATURE! OMG OMG OMG! ITS SO INAPPROPRIATE! @pensaer Do you like the golden animation? bite is fine. Do not believe those who talk it's bad. It especially good when you hit player with it. it produse 8 hitpoints difference. It especially good when you hit player with it. it produse 8 hitpoints difference. there are actual cards that heal for 8, and cost (1) less. those are horrible. says something about biting face. Don't you mean cost (1) more? Antique Healbot is 5, not 3. Healing Touch costs 3 mana.